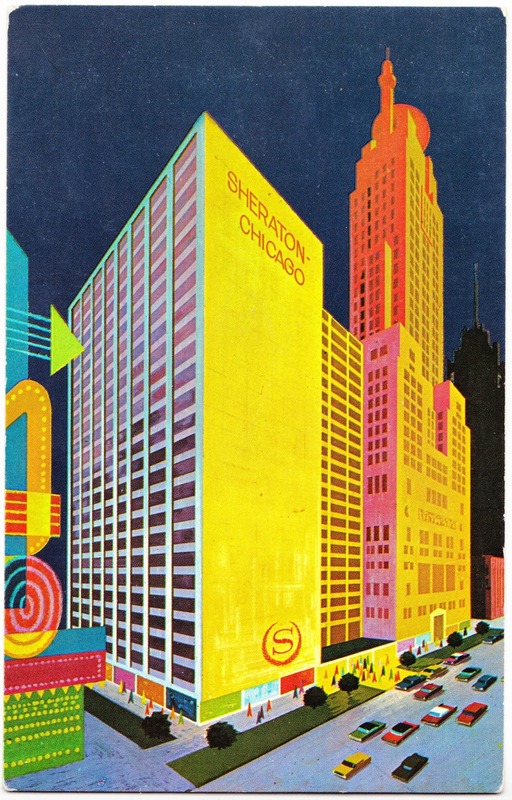 I love the artwork on this 1960s postcard for a Sheraton hotel in Chicago, Illinois. It looks like something that would be right at home in Mad Men. Unfortunately, there is no indication on the front or back of the artist who deserves credit for this. We know only that it was a Lusterchrome card made by Tichnor Bros. of Boston, Massachusetts. The card was published by International Hotel Supply Co., also of Boston. Teletype 312-222-07491100 luxurious rooms ... Magnificent indoor swimming pool ... Exotic "Kon-Tiki" Restaurant ... Located on beautiful Michigan Avenue near City's smartest shops ... adjacent to City's newspapers and advertising agencies ... within walking distance of Chicago's Loop. Free Parking. Family Plan. Confirmed in Seconds via Sheraton's exclusive "Reservatron II"
This building has a storied history. It was designed by architect Walter W. Ahlschlager and built in 1929 as the Medinah Athletic Club, a luxury men's club.1 But then it fell victim to the stock-market crash and closed in 1934. It went through several incarnations, including serving as residential apartments at one point, before being transformed into a hotel in 1944. Over the years, it has been the Continental Hotel and Town Club, a Sheraton hotel (there was expansion and the addition of the "Kon-Tiki" Restaurant during that period) and a Radisson hotel. It is now the InterContinental Chicago Magnificent Mile and is on the list of Historic Hotels of America. "Restoration work was guided by the original athletic club's 1930 yearbook, the SCIMITAR, donated by a club member. Its black-and-white photographs were used to duplicate and restore entire rooms, right down to the detailing in draperies, carpets and murals. Today, each floor of the hotel represents a myriad of cultures and eras." "The four-story lobby features a grand staircase with cast-bronze friezes along the handrail taken from the original Medinah Athletic Club, showcasing a harmonious merging of old-world elegance with 21st-century craftsmanship. Ceilings are painted in dark tones with Celtic and Mesopotamian motifs of the lion, the fish, the eagle and the Assyrian bull to typify the highest powers of nature." "The Grand Ballroom is the site of some of Chicago's most elaborate weddings and events. Located on the seventh floor with a balcony on the eighth floor, the Grand Ballroom is designed in an unusual elliptical shape. Around the ceiling are 37 hand-painted murals of classical landscape scenes that were taken down and restored by the artist who consulted on the restoration of the Sistine Chapel ceiling. He also added 24-karat gold leaf to the moldings surrounding the paintings and the 12,000-pound Baccarat crystal chandelier, the largest in North America." "Directly above the Grand Ballroom is the hotel's famous junior Olympic swimming pool. Although the original athletic club facilities included a gymnasium, running track, bowling alley, golf driving range and archery range, the pool is the only element to survive today. Considered an engineering feat when it was built in 1929 because it was above ground, the pool is 25 meters long, and holds 120,000 gallons of water. It has had many famous visitors, including Olympic gold medalist and Tarzan star Johnny Weissmuller." 1. According to Wikipedia: "The cornerstone of the Medinah Athletic Club was laid on November 5, 1928. In a ceremony held that day, a copper box was placed within the cornerstone to commemorate the occasion. Filled with records of their organization, photographs of its members, a copy of the Chicago Tribune announcing the proposal of the building, coins, and other historic data, this time capsule remains sealed within the hotel’s limestone exterior." Hi, I have a copy of this postcard. You can see it here http://rocksandtime.blogspot.com/ The card is used and the message is interesting. Yoshi is was in Chicago and is traveling to LA, San Francisco and then Hawaii and Japan. He mailed it to a woman in Cincinnati and used a West Virginia stamp. I am fascinated by these litte time travelers. Thanks for your interesting blog.